Professional truck drivers can face on-the-job hazards every day, many of which can arise from work-related activities other than driving, such as strapping a load, using a pry bar, or working with landing gear. WorkSafeBC, in partnership with Safety Driven – Trucking Safety Council of BC, is introducing a new video series and set of corresponding resources to help reduce the risk of injury to drivers. From 2008-17, the transport truck driver occupation in BC had more than 20,700 time-loss injury claims and 140 work-related deaths. Meet Joe: Dog-father, truck driver, cooking show enthusiast. Watch what happens when his life takes a bad turn after he injures his back while operating the landing gear on his trailer. Meet Donna: Mom, delivery truck driver, amateur tennis player. Watch what happens when her life takes a bad turn after she’s struck by a pry bar while securing a load. Visit WorkSafeBC’s commercial trucking and transportation information online to learn more, as well as SafetyDriven.ca. 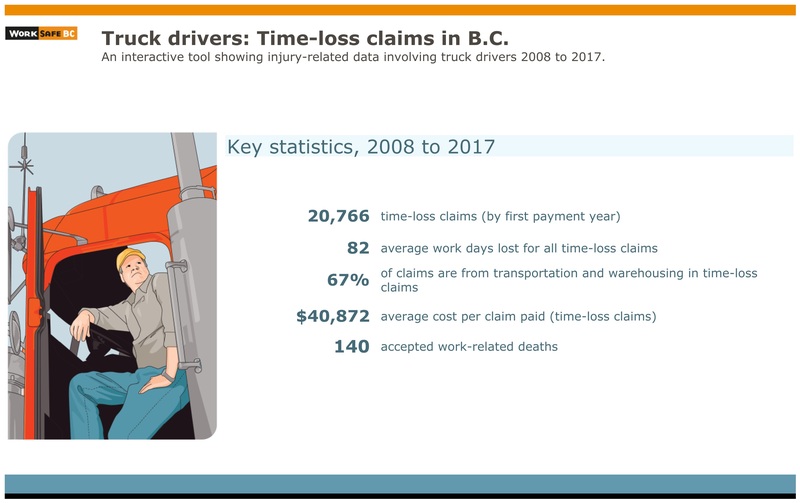 WorkSafeBC has also produced a new online interactive tool, illustrating professional truck driver injury statistics by year, claim type, accident type, gender, age, and sample incident descriptions.